SHARK SENSES - smell, taste, touch, sight, hearing and electroreception. Sharks and rays possess highly acute senses to interpret their surroundings. As a group they have maximized their potential habitats by adapting their senses to function in often adverse conditions such as dark or turbid water. Their sensory organs fit (sometimes loosely) into the six categories of sight, hearing, taste, touch, smell, and electroreception. The olfactory ability in sharks is well known, although the idea that sharks are able to detect and follow a drop of blood diluted in the ocean over many miles is an exaggeration. 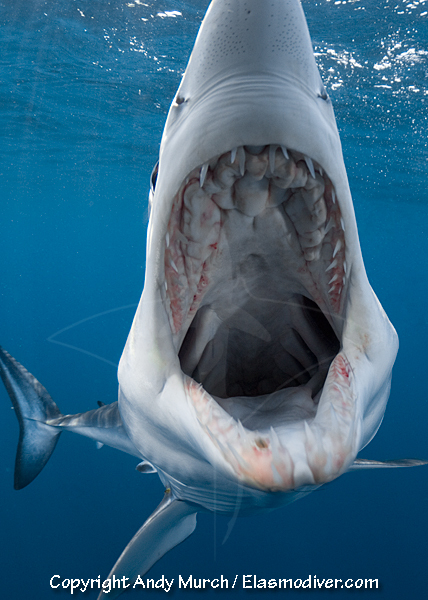 Sharks possess a pair of nares, nostril-like holes that are located just under the leading edge of the snout. Each nare is divided by a nasal flap into two openings. Water is channeled into the incurrent aperture and having passed over the olfactory lamellae exits the olfactory sac through the excurrent aperture. The olfactory lamellae are a series of folds on the interior surface of the olfactory sac which increase the surface area giving the shark more opportunity to register smells. Odors passing over the olfactory lamellae stimulate the cilia-like endings of neuro-sensory cells. What actually happens is, dissolved molecules transported along in the water column bind to receptor cells which then send a signal to the brain. This is referred to as a chemosensory function. Sharks have olfactory bulbs which are anterior extensions of the large olfactory lobe in the fore-brain that lead directly into the olfactory sacs. fibers in the olfactory bulb continue directly into the olfactory tract. With such advanced hardware it is not surprising that sharks are able to detect fish extracts in concentrations lower than 1 part in 10 billion! Once a shark picks up a scent trail it swims up the trail moving its head from side to side (which is its natural swimming motion). As its snout passes backwards and forwards through the scent trail it is able to determine the direction from which the odor is emanating. If the scent is lost or if the slick is too wide to use for navigation, the shark may swim forward in an exaggerated S pattern until it can pick up the direction again. The nares are completely seperate from the mouth and throat and therefore do not aid at all in respiration. In order to detect odors, sedentary species are able to pump water over the nares whilst resting on the sea floor. Not all sharks require a highly developed olfactory system. Whilst sense of smell may be the prime hunting tool for an Oceanic whitetip shark swimming along in the featureless ocean, an angel shark laying in wait for a meal is primarily a visual predator and consequently its olfactory sense is not so finely tuned. However, odor detection is not only used in hunting. Sharks and rays produce pheromones which signal their reproductive state to potential mates and smell may also be used in navigation. Oceanic whitetip sharks have been seen with their snouts out of the water supposedly sniffing the air. This may allow them to detect odors over far greater distances than would be possible under water. Many sharks depend heavily on their vision whilst hunting although there are occasions where the eyes play little or no role at all such as when a hammerhead is searching for a stingray which is completely buried. In the majority of species, the eyes are well developed, large, and complex structures. Some species are also able to sense light and dark through a thin area of skin on top of the head which leads directly to the pineal gland in the brain. As there is no lens to focus the light there is no shape perception but the shark may be able to use the differing light levels to time its vertical migration throughout the day. Many shallow water sharks are able to regulate the amount of light entering their eyes by dilating or contracting their pupils in the same manner that we do. In some species this is done laterally whereby the sharks eyes resemble those of a cat. However in some skate and ray species the pupil contracts into a horseshoe shaped slit. This creates a kind of double vision which the skate or ray can use to determine distance. Some species use a different technique all together. They have a ragged flap which slides over the pupil effectively blocking out much of the light entering the eye. This flap produces multiple images similar to those produced by the crescent shaped pupil and again aids in depth perception. Focusing in sharks is accomplished with the aid of the rectus muscles which pull the lens closer to or further away from the retina just as a camera lens focuses. This differs from higher vertebrates in which the lens is distorted in order to focus light from different distances. These muscles combined with the oblique muscles also control the direction that the eye faces. Due to the poorly lit environment in which some deep water sharks live, they lack the ability to stop light from entering their eyes. This inability to shroud their eyes from intense light may explain why sixgills are seen in shallower water more regularly in the summer; as this is the time of higher concentrations of suspended plankton near the surface creating a darker shallow water environment. 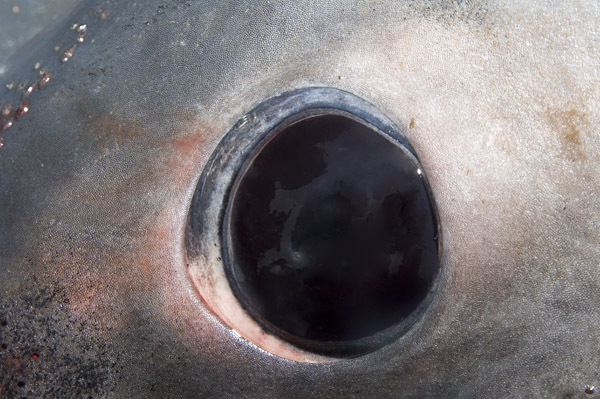 Sixgills and other species such as the Bigeye thresher shark have very large eyes and not surprisingly have no cones for sensing color. There are however somewhere in the region of twenty species of sharks that do possess both rods and cones in their eyes. But, the question regarding a shark's ability to tell one color from another is still undecided. Dr. Eugenie Clark once performed a test on lemon sharks that she had trained to push a white panel lowered into their pen at which point they were rewarded with food. At one feeding the panel color was substituted for a yellow one at which point the approaching Lemon shark almost back flipped in the water and refused to ever eat again. Whether this proves that the shark was able to determine the change of color or whether the slight change of brightness was responsible for its behavior is not clear. Most sharks possess excellent vision in low light conditions. The structure in the eye responsible for this is called the tapetum lucidum. This is a layer composed of mirrored crystals which lay behind the retina that can be adjusted to reflect light back onto the retina amplifying the strength of the image. Sharks share this ability with some nocturnal mammals and reptiles which require extremely sensitive vision to survive. Unlike bony fishes sharks do possess eyelids (both upper and lower) but they are fixed and unable to cover the eye. Requiem sharks have developed a toughened layer known as the nictitating membrane that rises from below the eye to completely cover it during feeding rendering the shark blind from a purely sight oriented perspective. White sharks and some others that do not possess a nictitating membrane are able to roll their eyes back in their sockets protecting the pupils and exposing a hardened pad on the back of the eye. White sharks have been seen to lift their heads out of the water far enough to get a look at their topside surroundings. This behavior has been witnessed in the presence of boats but possibly developed from the sharks desire to determine whether seals or sea lions are present in the area. It is unclear how well their eyes are adapted to above water vision. Touch can be split into actual contact and distant touch experienced through the lateral line system. Many sharks will nose an object prior to biting it in an effort to establish its edibility. The bite itself is also an exploration of touch as well as taste. A more alien concept for us to relate to is the distant touch that is picked up through the lateral line canals. A series of interconnected canals run back from the back of the head all the way to the upper lobe of the tail in a distinct line. On the head itself are the infraorbital canal which extends ventrally from behind the eye along the snout, the supraorbital canal which passes above the eye towards the snout eventually connecting to the infraorbital canal, and the supratemporal canal which leads back over the top of the head. Secondary canals may also be present around the head and jaw. The canals open to the outside of the skin by means of tiny pores which allow water to penetrate. As water is displaced by the movement of creatures in the sharks surroundings, small waves are created which move away from the disturbances like ripples on a pond. As these waves pass over the hairs which line the lateral line canals the hairs are disturbed and send signals to the brain. The sharks own movement also creates these waves which then bounce off obstructions and return to the shark creating a kind of vibration echo map of its surroundings. The frequency or erratic nature of the vibrations indicate whether any animals in the area are sick or injured. Sharks also possess a row of pores around the pectoral fins and gills, known as pit organs. These contain neuromast-like cells that are believed to aid the shark in the detection of temperature changes. Temperature may be an important factor for certain migratory sharks. For example sharks such as Spiny dogfish follow temperature gradients north along the coasts of North America during the spring and summer months to take advantage of the salmon and other migratory species. Once the temperatures start to cool this is their environmental cue to return south for the winter. Its possible that some sharks may seek out particular temperatures where they know that a prey species is most likely to be present. 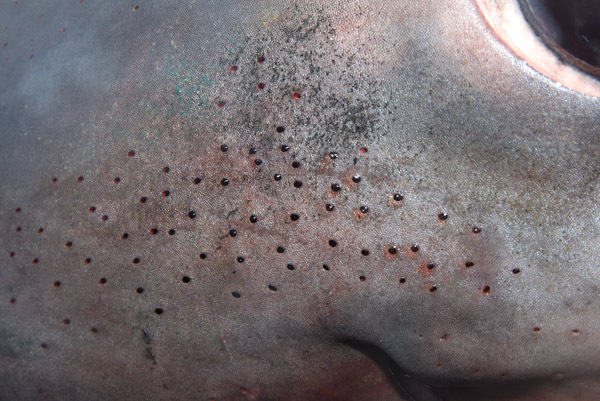 At some point during the evolution of elasmobranchs the lateral line pores around the snout developed a sensitivity to fluctuations of the electrical fields in the sharks habitat. These modified sensory organs are known as the ampullae of Lorenzini. They consist of relatively large bulbous pores filled with a gelatinous substance. Connected to the pores are cylindrical canals in which the gelatinous secretions are stored. At the base of each pore is a sensory nerve which transports the electrical signals (which are collected by sensory cells lining the pore) to the brain. Actively hunting sharks may have as many as 1500 ampullae around their snout and head whilst more sedate species may only have a few hundred. The ampullae also react to a lesser degree to temperature and pressure changes. The ability of sharks and rays to detect weak electrical signals in their surroundings may be one of the greatest factors relating to their survival through the millennia. The organs are sensitive enough for hammerheads and some other sharks to detect the small electrical signals put out by their prey whilst it hides motionless below the sand. In fact the ampullae are so sensitive that they can pick up voltage fluctuations of just 10 millionths of a volt or the equivalent of the electrical gradient of a AA battery with wires put into the sea 1 mile apart. It has been suggested that the widened heads of the hammerhead family may be an adaptation designed to increase the triangulation capabilities of their electroreception. When sharks are close to prey it appears that their electrical sense takes over from sight or smell. This would explain why sharks which have been chummed to a fishing or shark diving boat will sometimes attack the propellers and other metal objects rather than the bait which has been put in the water in front of them. Photographers (and I can testify to this) may have the unnerving experience of having a shark maul their underwater camera strobes which emit strong electrical fields. Sharks will also respond more aggressively to the erratic electrical signals emitted by a wounded animal. This may explain why shark attack victims are repeatedly bitten whilst rescuers swimming next to them often remain completely unscathed. Some sharks migrate across thousands of miles of bottomless ocean. Other fish which do this are believed to navigate by sensing the polarization of the earths magnetic fields through the presence of magnetite in their bodies. Sharks however do not possess magnetite and it has baffled researchers how a shark can navigate effectively across huge expanses of open water. Many senses may play a part in this type of navigation but one interesting idea is that the saline environment that they swim through combined with the magnetic fields around the earth may create a strong enough electrical gradient to lead the shark in the right direction. Equivalent to having a permanent North star in the sharks head. Taste is another chemosensory function similar to smell. 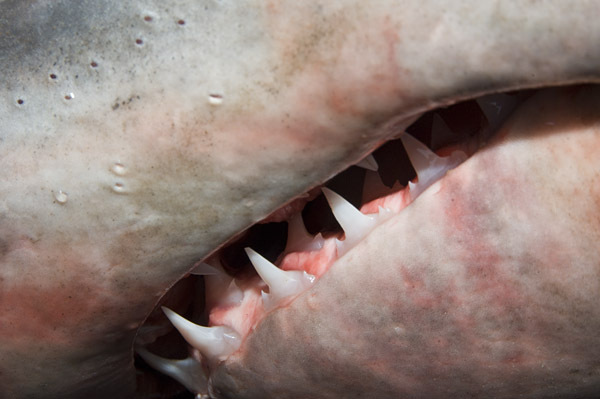 Sharks have small pits in the lining of the mouth and throat that contain rod shaped gustatory sensory cells. Once dissolved chemicals from the bitten object attach themselves to the gustatory cells a signal passes to the brain which is instrumental in determining whether the shark rejects the meal or not. The taste organs are not as highly adapted as other shark senses as they do not play a role in locating prey. The exception to this may be in species such as nurse sharks that possess whisker-like barbells protruding from the upper lip that can be raked through the sand possibly to taste for a meal. Porbeagle Shark Jaw - used for feeling as well as tasting. There has been a lot of speculation on the bite and release behavior exhibited by white sharks. Repeatedly in attacks on humans white sharks have been noted to take an initial chomp after which they often swim away. Partially due to this behavior 3/ 4 of white shark attacks are not fatal. One theory that may explain this is the idea that once the shark tastes the person and determines that it is not the high fat mammal that it was expecting, it does not waste its time eating and trying to digest a meal which will not provide the energy that it needs. Contradicting this is evidence that occasionally white sharks do partially or completely devour humans. An equally reasonable theory suggests that white sharks take an initial debilitating bite and leave the victim to bleed to death. This makes sense for a shark that preys on sea lions that possess a formidable set of teeth of their own. Whether sharks actually hear in the same sense that we do is unclear. The ears of sharks are completely internal. They are embedded within the chondrocranium (frontal skull). What looks like ear openings behind the eyes of sharks and rays are actually spiracles which primarily aid in respiration. As in the inner ears of higher vertebrates the ears of sharks are responsible for balance and equilibrium. The inner ear of sharks consists of a series of ducts and sacs collectively known as the membranous labyrinth. These cavities are filled with endolymph which in sharks is mainly sea water that enters through the endolymphatic ducts. Around the membranous labyrinth is another series of fluid filled canals known as the cartilaginous labyrinth that are supplied through the perilymphatic ducts. The cartilaginous labyrinth protects and supports the more sensitive membranous labyrinth within. The sacculus is a large inner chamber into which the endolymphatic ducts lead. Within this is an area called the lagena that has been shown to receive sound waves in some fishes. Lining the walls of the sacculus are patches of sensory epithelium covered with sand grains and calcareous deposits known as otoliths. As the shark banks the endolymph fluid and otoliths lag behind slightly. Their swaying registers on nearby sensory hair cells that send signals to the brain resulting in sensations of imbalance that the shark then corrects. Imagine the importance of good balance in an environment where there are sometimes no visual cues at all to tell you which way is up. At one time scientists thought that sharks may be able to hear with their entire bodies using their lateral line systems. This idea has since been discredited but the principle remains a reasonable one. Sound waves are after all little more than vibrations that fall within an animals auditory range. And, considering the importance of hearing it would make sense that such a successful group of animals as elasmobranchs would make use of it in one way or another.